The investigation and analysis of potential mold contamination can be extremely complex tasks. The risk in performing these services is great since many mold contamination projects can be highly litigious. Actions based on erroneous data can dramatically impact occupants of a building and the professionals involved in an investigation or remediation project. When choosing a laboratory to perform this type of work, it is crucial to find one with vast experience, a focus on quality and integrity of data, and one that can provide superior service to help a project progress smoothly. Forensic Analytical Laboratories' microbiologists are skilled at performing analysis of viable and non-viable mold samples, capable of assessing a variety of sample matrices, and experienced in providing detailed reports on fungal identification to a species level with traditional microbiological methods as well as Quantitative Real-time PCR methods. Our microbiology laboratories also provide a wide variety of support services for professionals working on mold projects. Various types of sampling media and equipment are available including Allergenco-D cassettes, culture media, tape lift kits, and Andersen samplers. Our staff is also available to provide consultation in making your mold investigation or remediation project highly effective, whether it is an initial survey, ongoing monitoring, or mitigation. Consistent with our other high quality services, our microbiology laboratories provide rapid turnaround time. Non-viable samples are analyzed on a one day turnaround time with a faster turnaround time available. 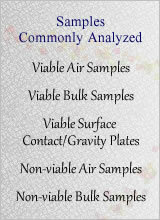 Viable samples are analyzed in 7-14 days. Supporting our laboratory group is a customer service staff that is skilled in understanding the needs of our clients. A single phone call to our toll-free number is all it takes to order new media, get results on a project, schedule a submission, or check pricing.